You are not logged in. [Log In] Weatherzone » Forums » Weather » General Weather » January 2019 Rain, other weather stats, comments etc. #1488009 - 30/01/2019 23:46 January 2019 Rain, other weather stats, comments etc. Feel free to post your January 2019 rainfall, other weather stats or comments etc. in this thread. Being January, we usually get one or two hot blasts over the month, when the wind moves around to northwest and the humidity plummets. Our highest over my 26 years of records has been 42.5° (in 2002), with a relative humidity 4%. But in January 2019 we got no such hair-dryer blasts, meaning our top maximum was a relatively sedate 34.5°. But because these temperatures occurred with the regular NE or NNE sea-breeze, the humidity stayed high. The average absolute humidity for the month was 17 g/m3, equal to our highest ever. During the month I was fortunate to spend ten days in northern China, on a trip to the Harbin ice festival, where temperatures were around 50° lower. The rest of the month was spent with the air conditioner on almost twenty-four hours every day, with me seriously contemplating moving to Adaminaby or Jindabyne. Usually during January one or two decent cold fronts come through, lowering temperatures and (more importantly) humidity for a day or two, but there was none to speak of in January 2019. Twenty-eight days saw a predominant wind direction of NE or NNE, only three saw SW or SSW. The result was that the lowest maximum temperature was an astonishing 27.0°. Previously the highest reading in the “lowest maximum temperature” column had been 24.7° (in 2017). Winds were on average stronger than any previous January, the average daily maximum gust being 36 km/h and the overall average 8 km/h. The average temperature for the month was also astonishing, at 26.0°, 2.3° above the long-term January average. And the lowest temperature for the month was 19.8°. Previously, the highest temperature in this column was 18.7° (in 2017). (The lowest temperature ever recorded in January has been 13.8°.) The average daily maximum of 30.4° was the highest of any January since 1994. There has only been one millimetre of rain in the last forty days. There were storms on a few days, and these provided brief but reasonably heavy rain to parts of the district, but they missed here. The BoM site at Coffs Harbour airport (around five kilometres away) also recorded only a millimetre during this period, although on a different day. With no break to the current weather pattern in sight, it is likely that there will be little or no rain in the next few weeks. Another record likely to be set is my next water bill (from watering gardens and lawns). All the data is in the usual place . In particular, take a look at page 15, to put into perspective how much hotter than normal this January has been. We registered 1/2mm in January and this is without doubt our coolest summer I’ve seen in living on the western downs for 12 years. We usually have consecutive days of 45 and up, even managed a 49 degree day last year based on our Oregon weather station, we have been lucky to have 4-5 days over 40 all summer and I don’t think we’ve reached over 42. Averaging 34-38 this summer. The nights on average have been cooler than normal, not sure on exact temps, but we have not had a single night where we felt it was too hot to sleep which is very unusual for our summers. Another big difference is the morning dews which we are STILL getting, summer, traditionally, we do not get many morning dews whereas this year 90% of December and January has seen morning dews including this morning. This is very unusual especially given how dry it is. In my region. Nobbys head finished with a +2.1° for max and +1.5° for minimum(59 years). 16mm of rain(avg 90mm). 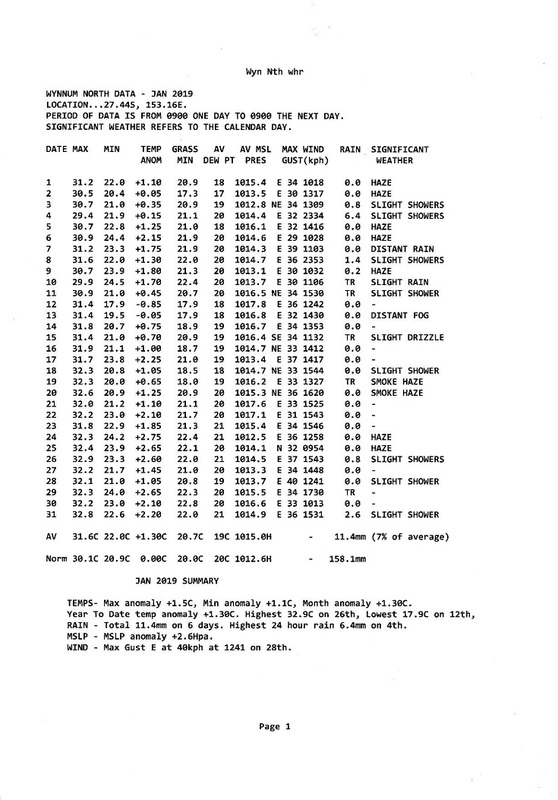 Williamtown about 10km from Nobbys recorded a +5.2° for the max(67 years) and +2.9° for minimum(66 years). 14.6mm of rain avg 103mm. Wonderful post Graham. Excellent summary of an exraordinary month for whole the sub-tropical east coast. I count myself lucky with 10mm (112y avg of 264, 2ks away at Crohamhurst). - 10.2mm fell during January, which is well below average. Rainfall was 135.6mm below the January average (January Avg. 145.8mm), or 7.00% of the average. - It is the driest January on record (records since 1939). The previous driest January was in 1942 when 15.0mm fell. - There were 3 raindays during January (Jan Avg. 13.5 raindays). - The wettest daily fall of rain was on the 22nd, when 8.0mm fell. - There were three thunderdays (day when thunder heard) during January, on the: 21st, 22nd & 23rd. The 'coldest temperatures ever' in North America are actually pretty localised, although they've been the lowest since the 1990s over a wide area (lowest since 1994 in Chicago and 1996 in Minneapolis, I think). As for Australia - hard to know where to start, but the national mean temperature was the highest on record for January by nearly a degree, and NSW by over 2 degrees. (NSW is also the largest monthly anomaly on record for any month for any state). January 2019 was the hottest month in recorded history for Hobart. Average was 25.9 degrees. Previous record 25.2. January 2019 was the equal hottest month in recorded history for Launceston. Average was 27.3 degrees. Jan 2019 was the equal driest month for Hobart (0.4 mm) in 137 years of records. BOM Stormspotter G0388 Roma S W Queensland Formerly Redcliffe. 0.2mm on January 18 for me = total January rainfall = total rainfall for the year. That’s a bit how’s ya father. just past 1000mm for the week in Townsville, yearly average is 1100mm. This event will make the Night of Noah look like a joke. 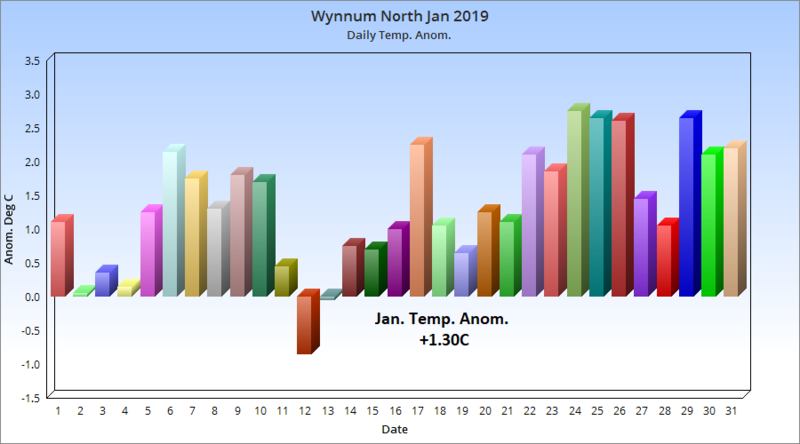 Wynnum North January 2019 Summary - Warm and very dry. Along with most of NSW, Manilla had an extremely hot January, more than two degrees hotter than any month in my 19-year record. Other climate variables were normal, except for rainfall in the 15th percentile. 68.4mm over 4 days average is 152.8 over 13 days. 64mm over 10 days average is 131 over 11 days. Dec and January for daytime temps have overall been below average , I attribute this to the constant SE/E wind flow we seem to be stuck in. Only hit 30 deg once last month. 1 registered (pikopancho), 59 Guests and 3 Spiders online.